Brooklyn Heights, NY — The #5 seeded Quinnipiac University Bobcats upset the #4 seeded St. Francis College Terriers, 80-72, on Thursday in the first round of the Northeast Conference tournament. Senior guard James Johnson scored 22 points and sophomore forward Ike Azotam (15 points, 12 rebounds) posted a double-double in the victory over St. Francis. Johnson broke Quinnipiac’s Division I scoring record with his performance as Azotam recorded his 14 double-double of the season. Zaid Hearst (14 points) was also in double-figures for the Bobcats. Sophomore point guard Brent Jones led the Terriers with a career-high 21 points as Ben Mockford (17 points), Travis Nichols (12 points) and Stefan Perunicic (11 points) were also in double-figures. Nichols hit a three-pointer to give St. Francis a 20-17 lead at the 7:48 mark in the opening stanza but the Bobcats responded with a 24-10 run to closeout the first half and led 41-31 at the break. The Terriers opened the second-half on a 17-8 run and cut the Bobcats lead to just a single point, 49-48, with 11:46 left in the game. Quinnipiac responded with the key spurt of the game as they scored nine straight points to extend their lead to 58-48 with 7:55 remaining. With point guard Dave Johnson already on the bench after picking up his fourth foul of the game, freshman guard Evan Conti checked in the game for Hearst. Conti poured in the last five points of the run as Johnson and Azotam each added baskets of their own. The Terriers would cut the lead to 60-56 with 5:52 remaining after freshman forward Jalen Cannon hit a pair of foul-shots and Jones converted a conventional three-point play, but that’s as close as they would get as the Bobcats held on to win 80-72. St. Francis shot just 36.8 percent (21-of-57) overall and were outrebounded by a 48-36 margin. Quinnipiac also outscored the Terriers by a 36-20 margin in the paint and shot 41.8 percent (28-of-67) from the field in the game. The Terriers finished with a 15-15 record for the second straight season. Quinnipiac will travel to take on the top-seeded LIU-Brooklyn Blackbirds in the Semifinals on Sunday, March 4 at 6:00p.m. 0:48 – Terriers cut lead 77-70 after Nichols’ lay-up. 1:15 – Bobcats lead 76-64 following Johnson’s drive-and-dish to Azotam. 1:45 – St. Francis is down 71-62 after Nichols knocks down a three-pointer. 2:11 – Quinnipiac extends lead to 70-59 after a 10-3 run. Johnson (16 points), Hearst (13 points), and Azotam (13 points) are all in double-figures for the Bobcats. 5:51 – St. Francis shrinks lead to 60-56 after Jones converts conventional three-point play. 6:43 – Terriers trail 60-53 after Cannon sinks a pair of foul-shots. 7:25- Bobcats lead 58-48 after a 9-0 run. 11:39 – Perunicic drains another from downtown as Terriers storm back from 10-point halftime deficit and cut lead to one point, 49-48. 12:38 – Quinnipiac head coach gets called for a technical foul and Perunicic capitalizes by sinking two foul-shots. St. Francis trails 47-45. 14:00 – Perunicic and Mockford hit back-to-back three-pointers for SFC and cut lead 47-43. 15:15 – Terriers trail 45-37 after Mockford hits one-of-two free-throws. Quinnipiac led by as many as 14 points in the first half on 60 percent (6-of-10) shooting from three-point range. As a team the Bobcats are shooting 37.8 percent (14-of-37) overall and 70 percent (7-of-10) from the charity-stripe. Hearst (11 points) and Johnson (10 points) are in double-figures for Quinnipiac. Ben Mockford leads the way for the Terriers with 10 points thus far. St. Francis is shooting 37 percent (10-of-27) overall, 40 percent (6-of-15) from downtown, and 50 percent (5-of-10) from the foul-line. Quinnipiac has outscored St. Francis in the paint by a 16-8 margin. The visiting Bobcats have also corralled more rebounds than the Terriers by a 23-19 mark. 0:35 – St. Francis cuts lead to 40-31 after Nichols sinks two free-throws. Terriers are on an 8-2 spurt. 2:24 – Quinnipiac leads 37-23 after a 20-6 run. Zaid Hearst has a team-high 11 points for the Bobcats. 7:45 – Terriers lead 20-17 after Nichols knocks down a three-pointer. 11:19 – Mockford gives St. Francis a 15-13 lead after draining another long-range bomb. 12:00 – St. Francis trails 13-12 following monster slam by Milk. 13:51 – Terriers level score at 10-10 after Douglas hits one-of-two foul-shots. 15:55 – Bobcats lead Terriers 10-9. Mockford has seven points for St. Francis. 17:00 – Quinnipiac takes first lead of game, 8-7, after a 6-1 run. 18:00 – Terriers take 6-2 lead after four straight points by Mockford. 19:36 – St. Francis scores first points of game on lay-up by Johnson. Each of the top four seeds fell in their regular season finales on Saturday, while the four lower teams in the playoff pool all won. LIU-Brooklyn clinched its second consecutive NEC regular-season title and this tournament’s #1 seed; they will have home court advantage throughout the playoffs. LIU also earned the league’s automatic bid to the Postseason NIT. The winning teams in the NEC Quarterfinal games will advance to the semifinal round on Sunday, March 4. Both semifinal games will be televised on MSG and Fox College Sports at noon and 6:00 pm. The championship game is on Wednesday, March 7 at 7:00 pm and will be televised on ESPN2. 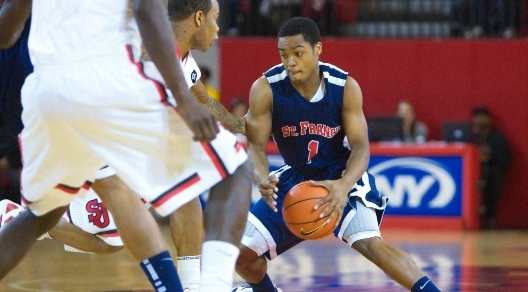 St. Francis (15-14, 12-6 NEC) is certainly the league’s most surprising team this season. In a preseason coach’s poll, the Terriers were predicted to finish in 11th place (second worst). But under the guidance of second-year head coach Glenn Braica, St. Francis has 12 conference victories this season, their best mark in league play in eight years. This is the first postseason game at the Pope Physical Education Center since 1997. The Northeast Conference announced yesterday that the 2011-2012 Coach of the Year honors was awarded to Coach Braica for his tremendous success this season. One of the key factors to St. Francis’ success this year was the emergence of freshman forward Jalen Cannon. The Northeast Conference has named Cannon to the 2011-2012 All Rookie Team. The power forward is the nation’s second-leading freshman rebounder and ranks fourth overall in the NEC with 8.8 per game. He also ranks fifth in the country in rebounds per 40 minutes at 14.4 per game. Cannon has posted 19 and 20 rebound performances over a ten day span in February with the 20-board display against FDU this past Saturday tying the NEC single-game season-high. The monster efforts on the glass were also the two most prolific rebound performances by an NEC freshman in 10 years. The Choice Hotels NEC Rookie of the Week back on January 16, Cannon averages 8.1 ppg and shoots 56.4 percent from the floor. He recorded double-figures in rebounds 12 times and paced all freshmen with eight double-doubles. Quinnipiac (17-12, 10-8 NEC) rolls into the Tournament with a full head of steam, winning eight of their last 11 games, including a four-point triumph over Robert Morris on Saturday in the regular-season finale. The Bobcats have qualified for the NEC playoffs seven straight years. St. Francis, however, has swept the series this season having defeated Quinnipiac twice, a thrilling 73-72 victory at home on Jan. 5, and a 64-56 win on the road Feb. 16.